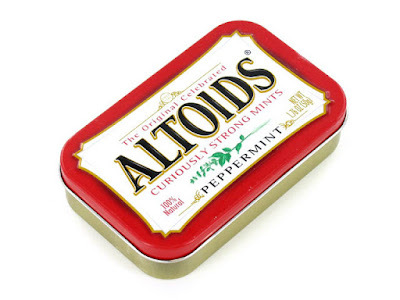 Jared Unzipped: Recycled Uses For Metal Altoids Tins. I love Altoids. They're a great little mint that can be stored anywhere and pack a wallop in your mouth! In fact, I keep a tin of Altoids on my office desk. Unfortunately, I always feel bad when I empty a tin and toss it in the recycling bin. This got me to thinking... what other ways could I re-purpose that neat metal tin when all the mints are gone? First Aid Kit. Stuff band-aids, swabs, antibiotic ointment, needle and thread inside. Store it in a glove box or camping bag! Portable S'Mores Oven. You read that right. Place graham crackers, mini marshmallows and slivers of chocolate bars inside the tin to create a s'more. Then, set your Altoids tin in a warm sunny spot (or on a hot surface) and let the marshmallows melt. Mmmm! Survival Kit. Sort of like the first aid kit, but insert items like a small compass, narrow rope cord, matches, a knife, flint and tinder, cotton balls or a mini screw driver. Emergency Candle. With the wax drippings from other used candles and a few small wicks from a hobby store, you can create an easily stored candle to use in case of a power outage. Pocket Tackle Box. The Altoids Tin is the perfect size for a few hooks, some weights, fishing line, swivels and other tiny fishing paraphernalia. Great for survivalists that want to try the minimalist approach! Art Kit. Paired with a tiny notebook, you can put drawing pencils or charcoal inside the tin. Tie a piece of twine or string around the tin and notebook for extra security. Portable Chess Set. With some small chess tokens and a folding game mat, you can create a fantastic chess set that doesn't take up a lot of space. Perfect for travel situations! Key Hide-A-Way. If you need to hide a spare key somewhere outside your home, the Altoids tin is perfect for that. You can put the key inside the tin, then bury it somewhere in your yard that only you will remember. Stash it inside a potted plant or in your garden bed. Of note, the metal tin can be easily painted with some spray paint. Just make sure to roughen the outside really well with some sandpaper before painting it. Customize it any way you want!